NOTE: The numbering is unfortunately not consistent. Please select the the photo to see whether the numbers are following the numbering system of the Rhodia paper of the Tomoe River paper! 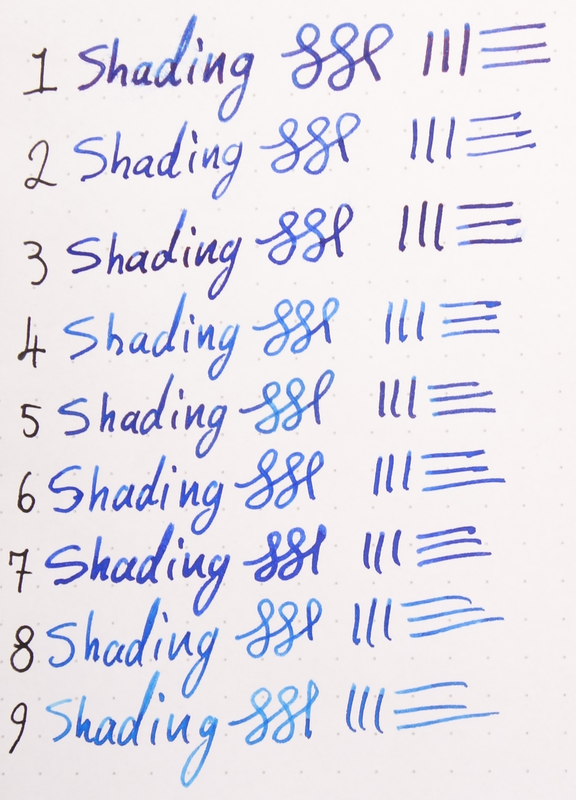 Numbers for Rhodia: 1) Parker Penman Sapphire; 2) Bungubox Sapphire; 3) Private Reserve DC Supershow Blue; 4) Diamine Blue Velvet; 5) Noodler's Liberty's Elysium; 6) Noodler's Mix; 7) Diamine Majestic Blue; 8) Noodler's Blue Eel; 9) Montblanc BMW Blue; 10) Private Reserve American Blue; and 11) Noodler's Baystate Blue. 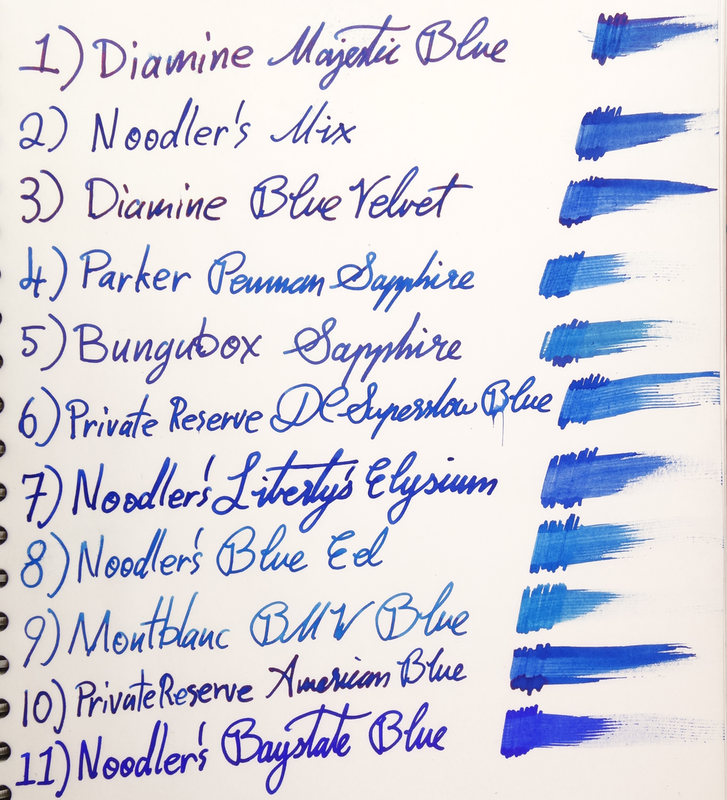 Numbers for Tomoe River: 1) Diamine Majestic Blue; 2) Noodler's Mix; 3) Diamine Blue Velvet; 4) Parker Penman Sapphire; 5) Bungubox Sapphire; 6) Private Reserve DC Supershow Blue; 7) Noodler's Liberty's Elysium; 8) Noodler's Blue Eel; 9) Montblanc BMW Blue; 10) Private Reserve American Blue; and 11) Noodler's Baystate Blue. I've been collecting Penman Sapphire alternatives for a while now and only recently got ahold of a real bottle of it. The inks I'm comparing it to are: Bungubox Sapphire, Diamine Blue Velvet, Private Reserve DC Supershow Blue, Noodler's Blue Eel, Noodler's Liberty's Elysium, Diamine Majestic Blue, a Noodler's mix from Fountain Pen Network called Noodler's Inkyman Sapphire (a 50/50 combination of Noodler's Navajo Turquoise and La Couleur Royale), and Montblanc BMW Blue. I've also included Private Reserve American Blue and Noodler's Baystate Blue for comparison but these aren't reviewed in as much detail. While I will focus on Parker Penman Sapphire I did include the other inks in my review page bellow. Parker Penman Sapphire isn't a dry ink, but it certainly isn't a wet ink. It takes a fairly short amount of time to dry on Rhodia paper. 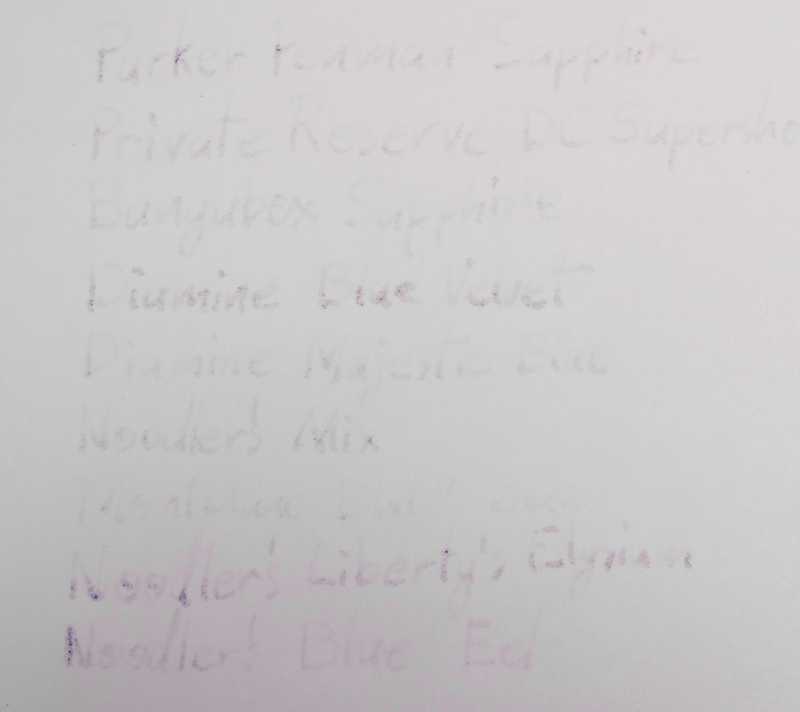 It took fifteen seconds for Penman Sapphire to dry compared to twenty for DC Supershow Blue and over a minute (!) for Bungubox Sapphire. All the other inks performed similarly to Penman Sapphire. The lubrication is decent and the shading is reasonably high. The sheen is mostly moderate but if you manage to put a wet line down you'll get a very nice amount of red sheen on the edges of the line. 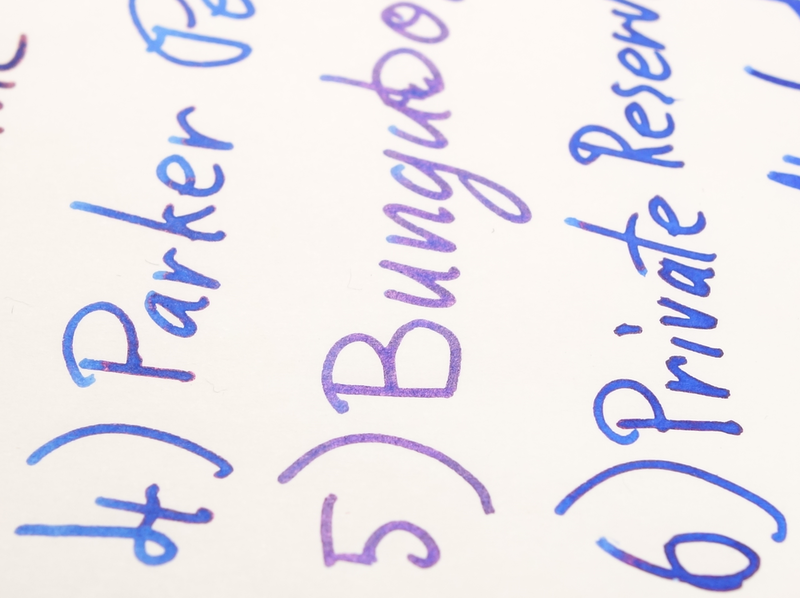 By comparison, the sheen of Bungubox Sapphire covers the entire line in a soft pink hue. DC Supershow is very similar to Penman Sapphire as is Blue Velvet but with a more coppery coloured sheen. Majestic Blue is by far the biggest sheener out of these inks with a vibrant shiny-red sheen cover the whole line. None of the Noodler's sheen at all (apart from barely with Baystate Blue). There is no feathering or bleeding from Penman Sapphire and the ink performs well on both Tomoe River and Rhodia. The feathering is also minimal on cheap copy paper as is the bleeding. Surprisingly DC Supershow performed slightly better on copy paper and but far the worst offender was Diamine Blue Velvet, closely followed by Noodler's Liberty's Elysium. Somewhat surprisingly the Noodler's Mix performed decently. Bungubox Sapphire performed well as expected and Montblnc BMW Blue performed the best. Both the Bungubox Sapphire bottle and the Penman Sapphire bottle have internal reservoirs whereby you tip the bottle over (with the lid on) to fill it up. This is to assist when the bottle is nearly empty. While the Penman Sapphire works, at least, with the Parker Duofold International I have, I know that the Bungubox round bottle struggles to fill #6 nibs without having to tilt the bottle while filling. This is true of all sailor bottles with the internal reservoir. I believe they are removable, but I haven't tried as I expect it to be a messy and wasteful endeavour! 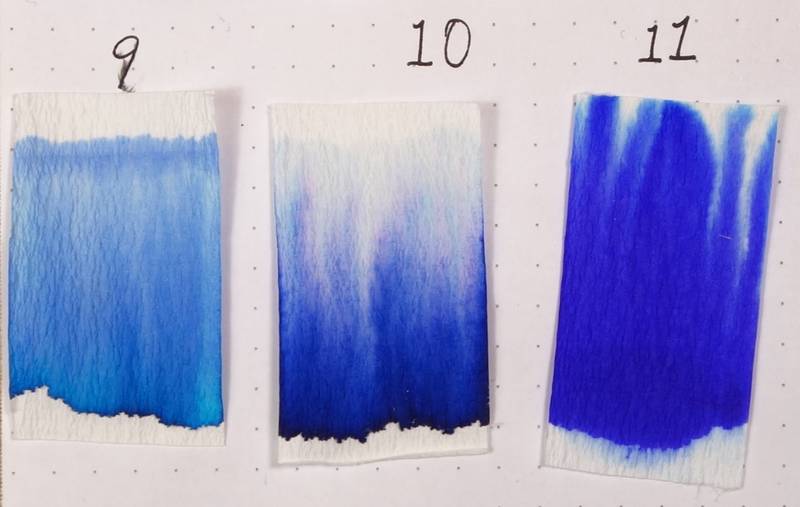 The Chromatography of these inks puts Bungubox Sapphire as the most interesting with distinct sky blue, purple, magenta and teal colours coming through. DC Supershow Blue and Blue Velvet are the too closest, respectively, to Penman Sapphire. They all have the slightly green hue at the top the moves to the blue closer to the inks ultimate colour down the bottom. While both Liberty's Elysium and American blue lack the green hue up above and Baystate Blue is just much more purple, Blue Eel is a little too light with too much sky blue colour and BMW seems to miss the darker colour of written Penman Sapphire altogether. I think the best alternative to Parker Penman Sapphire is Private Reserve DC Supershow Blue. Blue Velvet comes close, but is a little darker, and Bungubox Sapphire, while I prefer it and call it my favourite all-time ink, is just quite a bit different, mainly due to the sheen. The Noodler's Mix comes close but misses much of the shading and is a little too blue; if this ink had a drop or two more Navajo Turquoise and some water and lubricant to desaturated it a bit it might come a little closer. 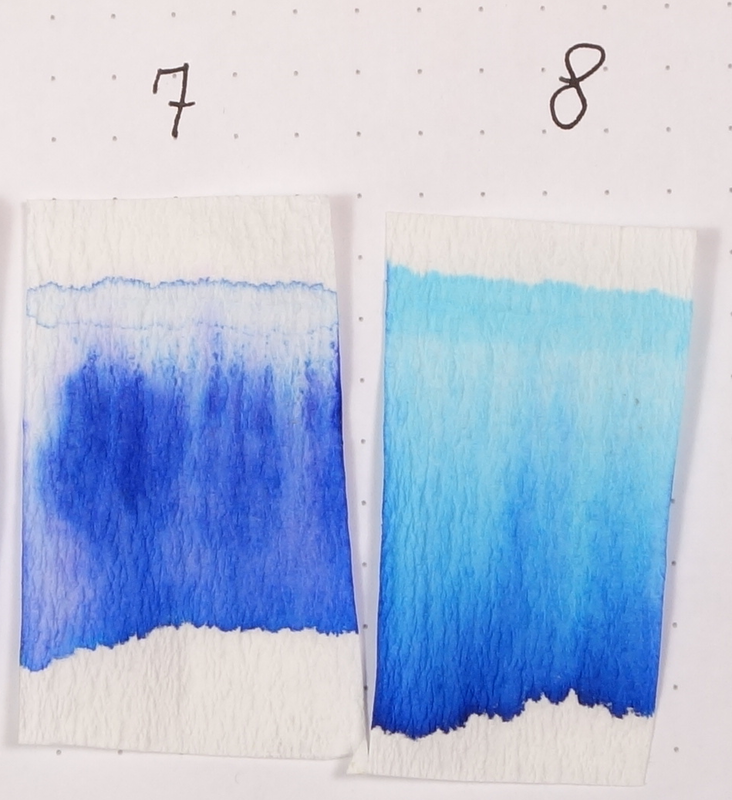 Majestic Blue is darker and less saturated and the sheen is overwhelming compared to the sheen of Penman Sapphire, and Baystate Blue just isn't close at all. Noodler's Blue Eel is surprisingly close, but is still a mark off it misses a lot of the darker colour of Penman Sapphire. 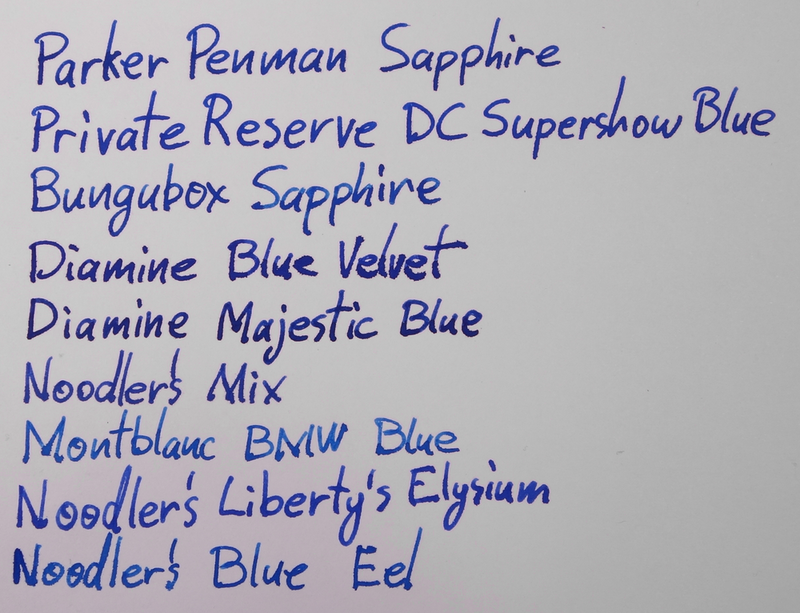 I love Bungubox Sapphire, so if you can get it and afford it I highly recommend it, but if you want something close to Penman Sapphire then Private Reserve DC Supershow Blue is the way to go and Diamine Blue Velvet comes not to far behind.